Playing the flute on tune is getting to be more and more important as you grow and learn music. There are many different scenarios that can arise being a flutist and we must learn how to play in tune! I hope that I can help you in this article. Please keep in mind that all flutes and mouths are different so these are generalizations that I have noticed throughout the last 30 years. There are different ways to tune a flute. Be sure to have a room temperature flute/warm flute when tuning. Rolling in to make notes flatter if you’re sharp, or rolling out to make notes sharper if you’re flat. There is also pulling out to make your overall sound flatter/lower, and pushing in to make your overall sound sharper/higher. Now, with the information just given, go get a tuner and tune your flute to the note “A” at 440hz. This note helps most of the notes on the flute stay in tune. Tuning to this note can also help when playing with a bigger group because of the wavelengths and different kinds of instruments. Don’t try to tune to your own ear because I’m pretty you didn’t start playing the flute with a tuner and were perfectly on tune your first time. I know I didn’t. We need to retrain our ears to tell what is sharp and flat and as you practice with a tuner, and then you’ll be able to tell the “special” notes unique to you. The second octave E is usually always flat. So, we need to plan and play accordingly. Be sure to use your pinky no matter what note you’re coming from and be sure to roll out a tiny bit. You may even need to write it in your music (highlight, circle, draw an arrow pointing up to remember to roll out or look up, etc.) to remember it. It may not happen with every E you play, so be sure to pay attention to your tuner while playing the song. Another commonly problematic note is the third octave C. This note is usually sharp- sometimes so sharp that it is almost C#! Yikes! Watch your tuner to know how far to roll in. I’ve also notice people tend to pull their cheeks back when playing this note and we need to do just the opposite. We need to put our cheeks forward and blow more down. Please keep in mind, these are just 2 of the most commonly out of tune notes. Get to know your flute. Go get a tuner and watch where your flute and mouth go flat or sharp or right on after tuning to the note “A”. If you can’t tune any note on your flute, or if it goes out of tune really fast, try checking your cork. Although, that is an article and video for another day. And, if you’re not part of this worldwide Intermediate Flute Studio yet,… we’d love you to join! I ordered this and I just love it! I’m really enjoying studying with you in the intermediate level. Your suggestions here for tuning are so helpful. I have a Korg tuner which I use every day. I strive for “that green light” meaning I’m on tune but as I play the lights seem to continually flicker from green to red either sharp or flat. Is that normal or should each note be perfectly “green” i.e. in. tune at all times? Amazon must love you! 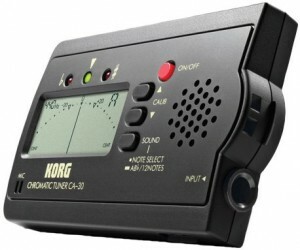 I ordered the Korg tuner. This info on tuning was very helpful. I appreciate the specific instructions on both general tuning and the E and C notes. Question: If your flute is tuned, then becomes cold, does that put it out of tune. I play for church and so there are time periods between playing when my flute is on an (appropriate) stand. When I pick it up it is sometimes very cold. I usually try to blow warm air into it before i play. I love your lessons, podcasts, bonus features – all of it! Thank you!